Nestled in the Allegheny Mountains of West Virginia, The Greenbrier is an award-winning property with accolades for its resort, golf courses, and mineral spa. There’s a lot of history here, and you’ll feel that legacy as soon as you enter the lobby. Its 1950s interior design by Dorothy Draper is well known throughout the world for its bright floral wallpaper, sea green and bubble gum pink upholstery, and black and white tile floors. The resort is a National Historic Landmark with its famous (but once secret) Cold War bunker. Families can choose their own experiences here, just like 27 presidents have done over the last 240 years. My 8- and 10-year-old boys were definitely up for the challenge of living like a POTUS – or at least doing as many fun activities as we could fit into a few days. KidTripster Tip: What’s that smell? If you’re outdoors and a faint, earthy odor waifs into your nose, it’s the sulfur springs (and hence the town’s name, White Sulphur Springs) under the property. The mineral baths are known for their health benefits. A better question may be, “What isn’t there to do?”. With more than 55 different activities, The Greenbrier’s excursions could keep your family busy for weeks. The challenge is determining a few must-dos during your stay. Swimming (both indoor and outdoor pools) and movie nights are included in the resort fee, but other activities carry additional costs that you’ll need to factor into your budget. We arrived at the resort during tea time. Afternoon Tea is a long-standing, daily tradition at The Greenbrier (and also included in the resort fee). I’ll be honest, my boys wrinkled their noses a bit at the thought of dressing up to go drink hot tea, but when they saw the array of sweet treats displayed in the main lobby, their eyes lit up with delight. In fact, they both asked to go each day of our stay and said that it wasn’t just for the desserts. They actually enjoyed the experience of drinking hot tea and eating petit fours in such a grand room. I’ve now been asked to buy some Earl Grey at the grocery store! We were really excited to tour The Greenbrier’s most notable and historical attraction - the bunker. Secretly built in the 1960s under the West Virginia Wing of the hotel, the 112,000-square-foot facility served as a ready-to-use fallout bunker for all 435 members of Congress during the Cold War and remained a secret for 30 years. The most fascinating part? It was hidden in plain sight the whole time, disguised as an exhibit hall for hotel guests and conferences! In the event of a nuclear attack on Washington, D.C., Congress would make the 5-hour trip to The Greenbrier, and all guests would be asked to leave. The bunker’s four, cleverly-hidden, 15-plus-ton, steel blast doors would be shut (which my boys tried to move to no avail), and the bunker would become the seat of government. Chambers for both the Senate and the House of Representatives were constructed so that they could meet as they would in Washington and deal with the ramifications of a post-nuclear America. The bunker was revealed by a newspaper reporter’s investigation in 1991. It was decommissioned a year later and then opened to the public. We took a fascinating, 90-minute, guided tour which kept both my boys fully engaged. Tour cost: Youth (10-17) $20; Adult $39. Must be age 10 and up. The resort also offers croquet, indoor and outdoor tennis, miniature golf, and horseback riding. The property has an on-site bowling alley (Cost: Youth $4/game; Adult $10/game, includes shoes), arcade, and movie theater that shows free, family-friendly movies. You can walk in the footsteps of PGA greats like Jack Nicklaus, Phil Michelson, and Bubba Watson at one of five golf courses, including the Snead Course, named after longtime PGA tour player and Greenbrier pro Sam Snead. The resort offers family golf after 4:00 p.m. on two courses – The Meadow and The Greenbrier. Cost: starts at $150/round for four players; golf club rentals are complimentary; junior clubs are available for players ages 12 and under. Even the pools are extra cool at The Greenbrier. There are two outdoor pools and one of the biggest, most unique indoor pools that we’ve ever seen. It looked like something out of a classic 1940s Esther Williams film with a pink and green tiled surface and billowy curtains hanging overhead. The best part was the warm temperature plus the fact that half of the 30-foot pool was just 3-feet deep, perfect for younger kids. The Greenbrier also caters to those who are craving an adrenaline rush. We decided to try something that we’ve never experienced before – off-roading in a Jeep Wrangler Rubicon. I was a little apprehensive about the gulleys, mud pits, and steep hills of the Allegheny Mountains, especially because it had been raining and was particularly slippery on the 30+ miles of trails dedicated to the Jeeps and Polaris RZRs that you can take out. However, under the watchful eye of my instructor Pat from Kate’s Mountain Outfitters, I rocked that course with a hair-raising 7 mph speed. I even mastered a couple of moguls, much to my boys’ delight. They said it was like being on a “nature rollercoaster.” I was white-knuckling it the whole ride. With tires taller and wider than both of my kids, Pat assured me that I had nothing to worry about. Cost: 1-hour session with three people in the car, only one can drive $285; 2-hour session with three people and three drivers $385. For the Jeep excursion, drivers must be 16 years old with valid driver’s license and 8 years old to ride. Polaris drivers also must be 16 years old with a valid driver’s license and 10 years old to ride. Other thrill-seeking experiences include the climbing tower and aerial adventures, both reserved via Greenbrier Outfitters conveniently located next to the outdoor pool and golf club. My 10-year-old ninja warrior and my husband conquered 12 different obstacles, all 50 feet in the air. Rest assured, nervous parents, even though it looks intimidating, they have a safety mechanism where at least one clip is connected to a line at all times, and most of the time, it’s two. Once you’ve finished scaling the tight rope, cargo net, cable bridges, and foot rings, you can free fall or zipline back down to the ground. Cost: $135/person; it typically takes close to three hours to complete. There’s no age restriction to fly high in the sky but kids under 10 must be accompanied by an adult. Perhaps the most unique activity that The Greenbrier offers is the falconry experience. Falconry is known as the ancient sport of kings and dates back thousands of years to China. You have the opportunity to become a junior falconer, learning about the history of the sport and the raptors that they have on site. Our engaging falcon expert, Cody, cast my boys as human obstacles for Nate, the Harris’s Hawk, who glided effortlessly between them while seeking a treat. The best part was being able to have a Saker falcon perch on our arms – a first for all of us and one of the coolest things that we’ve ever done. Cost: 90-minute session $139/person; open to all ages. If a spa treatment or adults-only round of golf is on your to-do list, you can drop off your kids (ages 3 and up) at the Adventure Zone where they can stay with trained staff and enjoy a variety of activities. Cost: $55/child/3.5 hours. KidTripster Tip: Many activities require reservations in advance. You can call (855) 453-4858 or ask a concierge to help you book your excursion. KidTripster Tip: Historical Preservation Fund adds a 6.5% fee to all purchases on the property in order to preserve and protect the grounds, buildings, and facilities. Winter is a magical time at The Greenbrier. 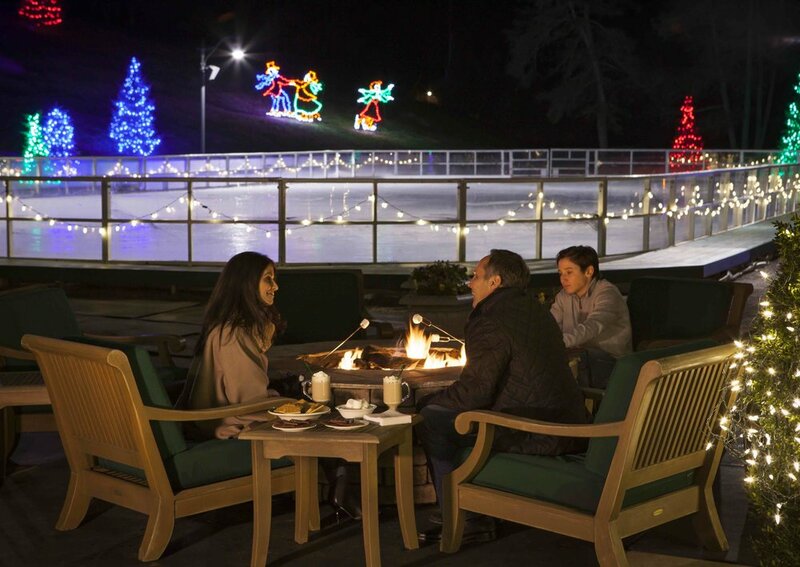 Imagine ice skating with the Allegheny Mountains as your backdrop at the outdoor rink or cuddling up beneath a blanket on a sleigh ride around the property. Seasonal cuisine is showcased at the restaurants, and lots of fun, indoor entertainment like magic shows, concerts, and bingo is available. The resort also offers hour-long shuttle rides to and from Winterplace Ski Resort so that you can hit the slopes. During the Christmas season, the resort hosts candy making, gingerbread house building, and cookie decorating. Hot chocolate and cookies are served each evening in the lobby which is decorated for the holidays. But the main attraction is The Greenbrier’s annual Gingerbread Ball on Christmas Eve. The Greenbrier is a sprawling, 11,000 acres, but the accommodations are all located within the same area near the main hotel. There are traditional hotel rooms and estate homes (for large groups or big families), but we stayed in a cozy cottage which had a separate sleeping area and parlor plus dressing area and large bathroom. The rooms are decorated in signature Dorothy Draper décor – boldly-colored floral wallpaper, modern Baroque furniture, and vibrant carpeting. Rates start at $288/night for a room that would accommodate a family of four and include the daily resort fee. KidTripster Tip: The Greenbrier offers a special Wintertime Package for a two-night stay with breakfast in the Main Dining Room, a shuttle to Winterplace Ski Resort, a 4-hour Adventure Zone experience for the kids (ages 3 to 12), and family entertainment shows. Cost: $699. KidTripster Tip: Many rooms have a wood-burning fireplace. In cooler weather, be sure to ask for firewood and toast your toes in your own parlor. The Greenbrier has 14 restaurants on the resort property, and the chefs make a special point to source as much food as they can from local West Virginia farmers. Knowing that we had the Main Dining Room breakfast buffet waiting for us made it easy to leap out of bed each morning. Made-to-order omelets and waffles plus pancakes with blackberry compote and West Virginia maple syrup were among my boys’ favorites. My husband and I found the blintzes to be a real treat. With two youngsters, we were most comfortable at Slammin’ Sammy’s, Sam Snead’s, and Draper’s. All the menus have a combination of salads, sandwiches, and entrées, and the atmosphere is a little less formal than some of the other restaurants. Draper’s has an ice cream bar and adult milkshakes (think chocolate shakes with a shot of mint liqueur). At Sammy’s and Snead’s, both named after famed golfer Sam Snead, you can ask for a table with a view of one of the five golf courses. There also are pool and foosball tables to keep kids entertained while waiting. An elegant and formal affair, dinner in the Main Dining Room was lovely and felt like we’d stepped back in time thanks to the elaborate crystal chandeliers and live music playing. For dinner, men are asked to wear jackets and ties, though children are not required to do so as long as they wear a nice, collared shirt. We were a bit nervous, but our boys displayed their best manners, and we enjoyed the fine cuisine that the Greenbrier is known for. KidTripster Tip: The Greenbrier does have a dress code for all restaurants and activities. Most places require resort wear (collared shirts, sweaters, Bermuda shorts, dress pants). Check the guide to ensure your attire is appropriate for your activity. Kids’ attire is a bit more relaxed, but something to consider when you pack. Dinner at The Forum was standard Italian fare, a hit with my boys who are pasta lovers, but because this restaurant is such a popular place for families, it was quite busy, and the service was slow. However, the tiramisu that serves two (really more like six!) is definitely worth the wait. What families especially will appreciate is that all of the restaurants that we dined at have a special kids’ menu that includes typical favorites like pasta, burgers, and chicken fingers but also some more unique offerings like shrimp cocktail and filet mignon. The wait staff also provides kids with activity booklets and crayons to keep them busy while waiting for their food. KidTripster Tip: A few of the restaurants close for the winter months. White Sulphur Springs is located in southeast West Virginia near the Virginia border and about 250 miles from Washington, D.C. There is commercial air service to Greenbrier Valley Airport via United with direct flights from Chicago and Washington D.C. Amtrak also is available from Washington; the train station is just across from the resort entrance. While at the resort, you won’t need a car. Shuttle service is provided to all activities. Writer Lori Green LeRoy is in the process of passing along her wanderlust and appreciation for different places and cultures to her two sons. The family lives in Indianapolis.